The Halsmer family has a lot of aviation history. Just two weeks after Charles Lindbergh crossed the Atlantic Ocean in 1927, Joe Halsmer watched four airplanes fly over, heading for the town of Lafayette. 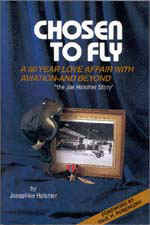 Because he had no money Joe didn't get to fly in the Standard, Canuck, or Jennies, but he did come away with a dream of flight that would not only provide him a living, but make him a pioneer in aviation. Joe Halsmer is Nate's grandfather. The book titled, "Chosen to Fly, a 60-Year Love Affair with Aviation - And Beyond," written by Joe's wife describes his aviation adventures from barnstorming to jets. 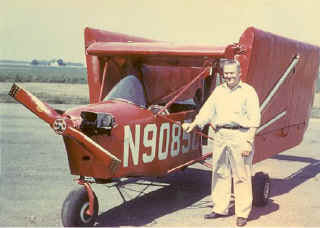 Joe helped to found Seaboard World Airlines, he was a Captain of international piloting for 27 years, co-owned and operated the Halsmer Airport for 50 years, and founded the Lafayette E.A.A chapter. Among Joseph's many inventions was the aircar, which is shown below. Additionally he logged over 30,000 hours of flying, crossed the Atlantic 1,400 times and the Pacific 450 times. The tradition of flight didn't stop with Joe, Nate's father and several of his aunts and uncles fly for the airlines. His mother and grandparents LeRoy and Martha Moore are also pilots. In fact the majority of Nate's 16 aunts and uncles are pilots, and so are many of their children. It's no wonder that Nate's interest in airplanes began at such a young age. 174 Sand Drive; Naples, FL 34104.